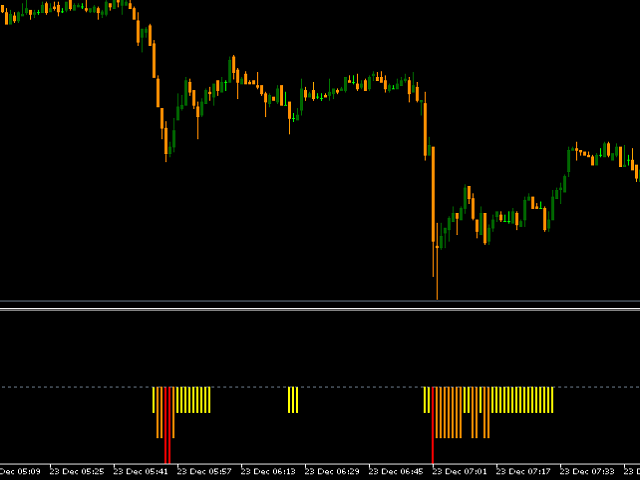 KForce Indicator depicts points in which prices are away from the normal movement. It does that by classifying the strength of a movement in three different ways: Light, Medium and Strong. Yellow bars represent light movements, which indicates that prices are slightly cheaper or more expensive than usual. Usually yellow bars are not a strong signal. Orange bars represent movements of medium force. It is a good indication that prices are far way from the average, and might be considered a good entry point if one is interested in a more active system. Finally, Red bars represent prices that are intensively far away from the usual movement. These bars occur less frequently, but provide the user with more secure entry or exit points. For smaller timeframes such as M1, M5 and M15, it is recommended to use higher Look Back Period such as 65. As for higher timeframes such as H1 and H4 it is advisable to use smaller Look Back Periods such as 25. 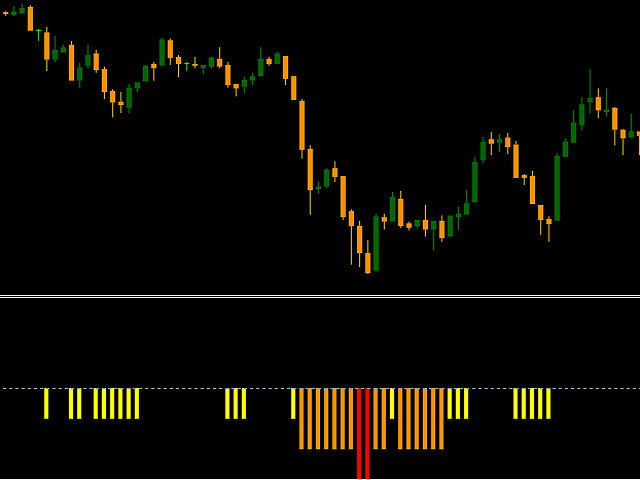 Look Back Period - the number of bars used for the indicator to look for price behavior. Layer One - first level for identifying that prices are away from the average. The smaller the value the more sensible the signal are, meaning more signals. Light signal (Yellow). Layer Two - second level for identifying that prices are away from the average. The smaller the value the more sensible the signal are, meaning more signals. Medium signal (Orange). Layer Three - third level for identifying that prices are away from the average. The smaller the value the more sensible the signal are, meaning more signals. Strong signal (Red). It is recommended to leave a distance of at least two points between layers/levels. For instance, 2, 4, 6 or 4, 7 and 10. These different layers/levels are very valuable for those interested in creating an averaging system. One could make an entry when then indicator goes Yellow, then a second entry when then indicator goes Orange and so on.